Love this almond butter! Truly raw and just very yummy! Yum! Arrived on time, undamaged and ready to eat...Thanks! Rich and smooth. I have it in my smoothie every morning. I love it! You will either love it or hate it. I love that it's raw and organic. Tastes so good but definitely not for everyone. This is a delicious almond butter - my husband loves the change from PB and my kids like the smooth texture. I love that it is raw and organic. This is the best almond butter I've tried so far. The best almond butter you can buy! Tastes better than roasted (i.e. the non-raw ones) and is organic and a thick smooth. Hurrah! Best raw almond butter I've tried. Texture is very smooth and on the thicker side, not grainy or runny. Tastes almost roasted. A delicious almond butter. I am very happy that it is available in a raw version too. We cannot buy the organic raw version in our province (NL), so I am quite thankful to be able to get it through well.ca. This is the absolute best almond butter that money can buy. I eat it everyday! It is expensive but totally worth it for the quality of the product. Thank you Nuts to You for making this almond butter! NUTS TO YOU RAW ALMOND BUTTER IS AMAZING! This brand always produces superior nut butters. I usually have the organic almond butter which has been roasted, on my toast and enjoy it immensely. This is the first time that I have had the pleasure of eating the raw organic almond butter and just loved it. Soooo creamy and decadent. I could just sit with a spoon and eat it by itself for a treat. Yum! And, oh so good for you! Highly recommend. This is the best almond butter I have ever tasted! It uses European almonds which are truly raw and you can really taste the difference. This site also gives you a good deal, much cheaper than going to the health food store. Creamy, organic, and raw...delicious almond butter! Cheaper here than in stores! Excellent taste and quality. Most important that it is raw and organic. Love this. Have a bit every morning with my toast. This is probably the BEST raw organic almond butter i've tried. Its so smooth and has a delicious flavor, probably because its made from European almonds as opposed the pasteurized Californian ones that are not truly raw. I buy these jars so much and they finish so quickly because it is just too darn yummy! So, so good. I love eating it on an apple. Delicious flavour. I love the fact that this nut butter is raw (i.e. unpasteurized) AND organic! Plus it tastes great and is a reasonable price (alternatives online seem to be more expensive). I wish they had the option of buying it in bulk as this would help save the some glass jars going into the landfills as I eat so much of it! I also love the fact that it is a Canadian company and they do not even have their own website or email they are so old school! Love that this is organic, great tasting. It's raw, organic and tastes great! Doesn't get much better than this. I use a bit each morning on a rice cake for my morning snack - keeps me going feeling balanced and satisfied. Highly recommend it. the fact it's organic that's great, love the taste. A staple food in my house! Great taste and texture. Perfect on bread, excellent on an apple. Good as a snack or as part of breakfast. One of the smoothest almond butters I have tried, with great flavour. Awesome product!! I love it spread on sliced apple. Amazing tasting almond butter, will buy again. The best almond butter on the market! This is great for a quick, nutritious snack on crackers - healthy fast food. It isn't sold in any of the stores in my area so I'm glad I found well.ca and glad they are expanding their health food inventory. My family loves this almond butter. It is very difficult to find raw nut butters so I am pleased that Well.ca carries it. A raw organic almond butter from Canada! What else can a Canadian woman on a living raw food diet desire more than that? And it's delicious, nutritious, affordable. 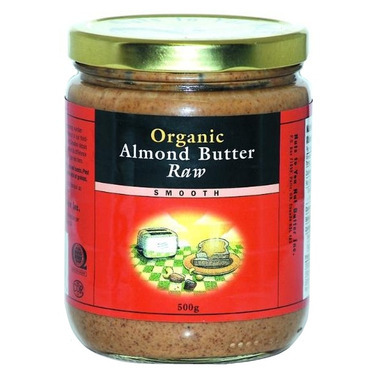 This organic raw organic almond butter is really good and contains only organic almonds! I just love the taste and spread it on toast, rice cakes, etc. Organic almond butter is unavailable in the stores near me, so this is a great deal along with the free shipping.